This year in Favela (slum) V8 we had 60 children ages 2-6 years old in the daycare The maintenance of the building, teaching materials, toys and the meals were paid for by donations. The daycare employs one teacher and one helper and salaries are paid for by generous donations to the priory. 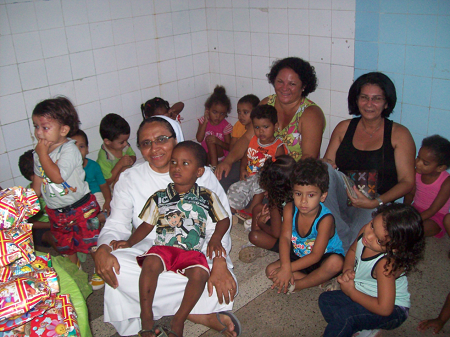 Our novitiate is fully engaged in the “Pastoral da Crianca” a social project of the Catholic Church for pregnant women and children up to 6 years of age. Through this ministry, we are in close contact with the families of Favela’s V8 and V9. The Priory reaches out to the families impacted by the culture of drugs and other criminal activity. This is brought about by the harsh economic circumstances Favela V8 faces.